A student at the University of Bahrain (UoB) allegedly beheaded a kitten and kept its bloody remains on display at one of the campus aisles. The ‘display of cruelty’ went on for nearly two weeks with many posting pictures online. Angered by the act, animal rights activists have announced BD800 reward for leads on the culprit. An official spokesperson for Bahrain Adoption, an animal rights organisation, said a few days ago he was alerted over a UoB student torturing a cat by burning it with cigarettes. “A few individuals contacted me on Instagram and informed me about this cruelty. They knew the person behind the act, but did not want to reveal as it would affect his future. “I reported the incident on all social media networks to obtain enough information to pursue legal action against the culprit. 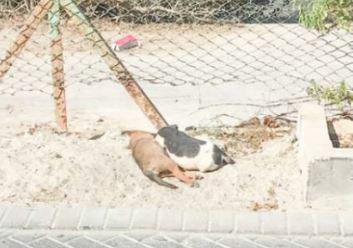 Mahmoud Faraj of Bahrain Society for Prevention of Cruelty on Animals (BSPCA) has taken up the issue with UoB officials, it is learnt. “What is disheartening is that UoB did not take any steps until the cruelty was discussed on social media,” the spokesperson said. “More than cruelty on animals, it is an issue of violence on campus. What if the student had used the same sharp object to attack another student on the campus?” The spokesperson said that hurting animals is against the values of Islam as well as that of any civilized society.